As you guys have heard me mentioned a couple of times in my IMM/What Are You Reading? posts, I’ve decided to re-read the entire Harry Potter series this summer. Even though I’ve read the books before, I’m ridiculously excited about this. I absolutely adore these books. J.K. Rowling has created a world that I would jump at the chance to live in without looking back. I was enchanted by these books when I first read them in my teenage years, and now I get to relive that experience. The other night, before I cracked open Harry Potter and the Sorcerer’s Stone, I sleepily gazed down at my copy and gazed at the copy. I’ve always thought the finished hardcovers of Harry Potter were gorgeous and admired the detail. 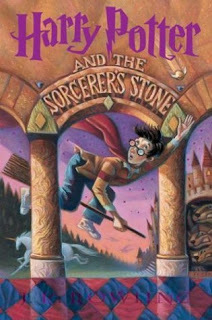 All of a sudden it rhit me how much the cover of Sorcerer’s Stone says about the individual book and the whole series. By simply looking at the cover you can tell that Harry Potter is a complex world, and that there’s a little something to interest just about everyone. The image in the foreground of Harry diving after a small golden object (I won’t reveal what it is for those who haven’t read the books) immediately sparks interest and curiosity by making readers think, “Cool! He’s on a broomstick!” and “Wait, what is he chasing?” However, there are also tons of smaller, eye-catching things in the background. First of all, there is a freaking castle. I don’t know about you guys but I am really enthusiastic about novels that incorporate castles. Inside the Castle we see a three-headed dog, which made me think of Ceberus, the three-headed dog in Greek mythology who guards the gates leading to the Underworld. Rowling was apparently a classics major during her time in college, and that shines through in some of the creatures she creates a well as in other aspects of the series. Another thing about this cover that also caught my eye right away was the unicorn. Who doesn’t love unicorns? All of these mythological and magical images promise that the pages of the book will be filled with an amazingly complex world and a story that is anything but mundane. Yet upon opening the pages, it gets even better. This book has humor, magic, bullies, and as readers progress through the series it also includes themes including prejudice, angst, love and good versus evil. Rowling has written a story with incredible amounts of depth, and with every re-read, I get something new out of these series. Most of you have already read Harry Potter, and some are probably doing the same thing as I am. For those who haven’t, next time you’re in a bookstore, pick up a copy of Harry Potter and the Sorcerer’s Stone and take a good, long look at it. As magical as the cover is, I think you’ll find something you like even better beneath it. I LOVE re-reading this series. For awhile, I was reading them at least once a year. I really love how these covers represent each book so well. I think it would catch the eye of a new reader and an old reader. The new readers can be overcome by a sense of wonder and fantasy. The older readers can pick out all of the things from the book that they love. It's perfect. Awesome post!! I re-read the first 4 in January and I re-read Deathly Hallows before part 1 came out. Oh how I love them. There are things about the covers that I never noticed the first time around--I guess I was just too engrossed with the story--but they are fantastically detailed!